President Barack Obama is picking Florida, Indiana, Louisville, Ohio State to reach the Final Four. 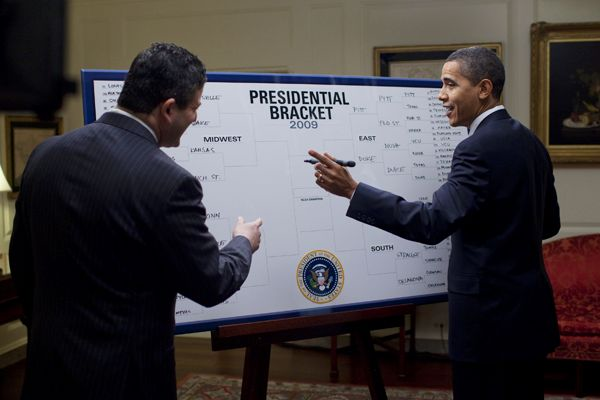 President Obama filled out an NCAA tournament bracket for ESPN for the fifth straight year. On the women’s side, he selected Baylor, California, UConn and Notre Dame to advance to New Orleans. ESPN will reveal his full men’s and women’s brackets Wednesday morning on schedule. This years senior players have played all four years and still no US budget. Welcome to March Madness.. This entry was posted on March 20, 2013 at 7:14 am and is filed under Uncategorized. You can follow any responses to this entry through the RSS 2.0 feed. You can leave a response, or trackback from your own site.